I’m thrilled to announce that I will be showing my work at the 32nd Arts and Crafts Conference at Asheville’s Grove Park Inn next February. I’ve long wished to exhibit my work at this splendid gathering, which I first attended about 16 years ago. It has been damn-near impossible to break in, partly because of a longtime policy whereby once an exhibitor has a booth, he or she may return annually. So I stopped trying and told myself to be grateful that I wasn’t making an 8-1/2-hour drive with a trailer full of heavy furniture and spending days standing around talking to strangers in a loud, stuffy room. A string of events led to this chance. I recently put the publisher of my book English Arts & Crafts Furniture in touch with the operator of the conference bookstore. (Could there be a more ideal marketing venue for this book than this event at the Grove Park Inn?) Putting these people together involved contacting Bruce Johnson, the event’s director. When a furniture maker from California decided to retire from the show, he offered a booth to me. Patricia Poore at Old-House Journal was the first to publish any of my writing. Over the years she has made space for my writing and furniture in Arts & Crafts Homes and the Revival, Old-House Interiors, and related magazines. Anissa Kapsales at Fine Woodworking has worked with me on several articles. Megan Fitzpatrick, longtime editor at Popular Woodworking (who now runs her own business, Rude Mechanicals Press), invited me to write a project article on an Arts and Crafts bookcase inspired by the designs of English furniture manufacturer Harris Lebus. When her books editor, Scott Francis, pitched the idea of a book on English Arts and Crafts furniture, she referred him to me. One of the best things about working with this trio of women, each of whom I admire deeply (for more reasons than would be appropriate to relate here), is that I now call each of them a friend. Like writing a book, doing a furniture show is a major undertaking. Out-of-town shows involve long drives, heavy lifting, and talking to strangers for hours each day. Sometimes sales amount to far less than the cost to participate. (For Michael Fortune’s take on marketing through shows, read this.) My husband used to think I was mad to put in the work for no discernible monetary return. But now he gets it. You have to put in the work and the time to get opportunities to do the kind of work you love. Too many people imagine that invitations to write books or build kitchens in cool old houses just fall in my lap (and the laps of others who do work that looks enviable). They don’t. These opportunities result from hard-core slog–and in turn they require more. Overall, as long as my back, eyes, and hands hold out, I say the slogging’s worthwhile. After admiring Patricia Poore’s work for many years, Mark finally got to meet her during a trip to Massachusetts in 2017. When most people stop at a fast food restaurant, they run in and out without so much as a glance at the surrounding landscape – and that’s if they get out of their car at all; a high percentage place their order in the drive-through and sit there idling until they’re at the head of the line. Cathryn Peters is different, at least when she visits her local McDonald’s in Cook, Minnesota. Peters doesn’t go there for the burgers. Her treat’s in a marshy spot behind the parking lot: bulrush. Peters has been weaving seats since the 1970s, when her son was an infant. Thinking that she should have something constructive to do besides caring for the baby, her mother-in-law brought over a seat frame she wanted to have woven, along with rush weaving instructions from a magazine article and a pack of paper fibre rush. (The British spelling is used in the United States to differentiate the artificial paper material from the natural cattails and bulrush). In the 40 plus years since then, Peters has woven thousands of seats – some for new chairs, some for chairs undergoing repair, and some she bought for resale. She also weaves traditional baskets in a variety of materials and her signature antler baskets. Although she has taken a few workshops in basketmaking, Peters is primarily self-taught at weaving seats. In the early years, pre-internet, she was able to get some direction from pamphlets provided by material suppliers. But most of her learning came from trial and error or from taking apart seats that were going to be rewoven to figure out the patterns. In the mid-1980s The Caner’s Handbook by Bruce Miller and Jim Widess, The Craft of Chair Seat Weaving by George Sterns, and a few other books were published – an immense help to seat weavers across the country. Resources in print and online, many of them written by Peters herself, have proliferated since then. A high point of Peters’s career came in 2006, when she was awarded a fellowship to study in England with basket maker and seat weaver Olivia Elton Barratt. Barratt was the President of the Basketmakers’ Association (BA) and was also installed that October as Prime Warden of Basketmakers in the Worshipful Company of Basketmakers, a guild in existence since 1569. During her ten-day fellowship and stay with Barratt, they traveled across the country meeting members of the Basketmakers’ and Seatweavers’ Association, of which Peters has been a member since the early 1990s. Barratt also taught Peters how to weave a bulrush boater’s hat at her home studio. They drove to see the harvesting of bulrush from the River Ouse with Felicity Irons, watch the weaving process of making willow coffins and hot-air balloon gondolas at Somerset Willows, visit the Coats basketry museum, and to the Musgrove Willows farm to learn how cultured willow is grown and how buff willow and white willow are processed. Peters weaves seats using a variety of natural and commercially prepared materials; natural bulrush, cattails, paper fibre, cane webbing, strand cane, Danish cord, rawhide, oak, ash and hickory bark splints. Natural hand-twisted rush seats are woven with the round stalk, stems or strands of the bulrush plant, and cattails with the flat leaves. Both plants are just right for harvest between late August and September, when they have reached maximum height and the ends of the cattail leaves have turned brown. Peters harvests the natural bulrush and cattails from her rural northern Minnesota farm and the surrounding area. With so many years of experience, Peters can weave a seat in far less time than it would take a beginner. The 15” seat for the hand-twisted bulrush Voysey chair would typically take her from six to eight hours to complete. After a couple of years, the fresh green and gold tones of the natural rush will fade to a nice, warm honey color. If you’re interested in learning how to weave hole-to-hole cane and over-the-rail cane seats, Peters will be teaching a class at the Marc Adams School of Woodworking on the weekend of Sept. 16 and 17, 2017. Some people have the vague notion that when you’ve been a woodworker for decades, you know how to do everything. If only. No one knows how to do everything. Experience in a variety of techniques may be transferable to new forms, but just because a technique will work does not mean it’s especially good in structural or aesthetic terms, let alone efficient to use in specific circumstances. When faced with a woodworking mystery–say, a look I want for a finish, or some convincing 3-D effect I’d like to produce in an 1/8-inch-deep relief carving–I like to try to answer the question for myself before I seek the answer from others. The effort of thinking a problem through will often give me deeper insight into methods others recommend, and it’s especially satisfying when I find that “my” method is the one used by other woodworkers I respect. I’ve enjoyed a few such moments while planning how to build a hayrake table for the book on English Arts & Crafts furniture I’m writing for Popular Woodworking. My contact at Bridgeman Images provided a hi-res image of Gimson’s original drawing for the table, which we will purchase the rights to reproduce in the book. I chose this particular table based on an original drawing by Ernest Gimson that I came across online. The artistry in the rendering is delightful, and the table fit the bill when I was looking for a furniture form distinct from the other two projects in the book, a chair and a sideboard. It wasn’t until I was at the lumberyard looking through stacks of sassafras that I got wind of the fun in store for me, thanks to a message from Frank Strazza. “The challenge is getting all 5 shoulders to meet perfectly, everything is scribed to fit,” he wrote in an Instagram post to which he referred me. My blood ran cold. Then I adjusted my perspective: This table is a puzzle. In for a penny, in for a pound, as they say across the Atlantic. Here are a few of the thrills I’ve enjoyed on this journey to date. I love the look of a lamb’s tongue, but in more than 30 years of work as a cabinetmaker, I had never before had occasion to make one. I devised my technique based on what made sense, starting with a saw kerf to make the clean transition from chamfer to carving. I made a sample; it worked well. Yeah, it’s super rough. It was a quick experiment in a piece of discarded wood. But I figured out how to make a lamb’s tongue. When you’re writing for publication, you want to be informed about these things. I was especially concerned that my use of the saw kerf might be way out in left field. So I did an online search. Up came a Lee Valley post written by Chris Schwarz, who starts with a saw kerf and follows through with a chisel, as I had. The hayrake table form I’ve seen published most often is based on one by Sidney Barnsley in which the stretcher meets the legs at a 90-degree angle. I’d seen the same leg-to-stretcher orientation in a gorgeous hayrake table made by Ernest Barnsley at The Wilson last spring. But the Gimson table’s stretcher rails meet the legs in a V—commonly known as a bird’s mouth in the realm of architectural moldings, which presents a challenge. I could see the joint being an actual bird’s mouth (in molding terms, if not in ornithological terms), preferably with a tenon or spline to lock the stretcher mechanically in place. Not that I was sure about how I’d create that mechanical part. Alternatively, the stretcher could be notched into the leg. Cool again. It’s so fun to learn a new technique that builds on stuff you already know. The hayrake stretchers meet the center stretcher rail at 45 degrees, and the drawing indicates a pegged mortise and tenon joint. This all seemed fine until I experimented with chopping the mortises. How would I get the point at the far end, I wondered—that is, make a mortise that ended in a pointed V? A trial tenon for the hayrake-to-center-rail joint, placed next to the full-scale layout. I tried to cut that sharp far point of the mortise but wondered whether it was really necessary. It seemed to me that it would make more sense to make that end of the tenon square, but I was worried that this might be cutting corners. (Ouch.) So I looked up Mike Pekovich’s article from 2012. Mike cut the far end of the tenon square. It seemed like a good idea to leave the stretcher parts long, cutting each joint in a logical sequence called for by the structure. This way I wouldn’t cut the joint on one end of a part only to find I’d thereby made the part too short to allow for the joint on the other end. Leaving the parts long would also allow me enough material to redo a joint if I messed it up. If I was correct, the parts should come together like a puzzle. It was nice to see that Mike recommends just this approach in his article, although the joinery in that table has significant differences from that in the Gimson example. David Berman of Trustworth Studios is a man of uncommonly varied accomplishments. Born in Brooklyn, he was raised to follow his father into the family business, D. Berman and Son, which sold high-power electrical equipment. But after a stint as a purchasing agent at his father’s plant he rejected this white-collar fate. “Boredom with the corporate world forced me into my true nature,” he says, recalling the satisfaction of changing his old car’s exhaust system on his off hours and the joy of restoring antique musical boxes to working order. Berman moved to Massachusetts in his mid-20s, as did many of his college friends. It was the 1970s; as so many of us do today, you earned a bachelor’s degree (Berman’s was in English) and promptly found work in painting or construction. In partnership with a friend, he formed a company that specialized in rehabilitating old houses. Learning on the job, he found he had a knack for shingling. One day, while working on the roof of an oceanfront house, he happened to glance toward the water and saw the Mayflower sailing by. “I’m having a hallucination from heat stroke,” he thought. But it really was the Mayflower. As his skills increased and his appreciation of historic buildings grew more refined, Berman took on more challenging projects. In 1979 he moved a barn to Nantucket and converted it to a house. He then constructed a frame house entirely from scratch: the fictitious house to which the barn might originally have belonged. The new “old house” would be used to accommodate guests. The business partnership dissolved in 1982, and Berman moved to Trustworth in Scituate, Massachusetts, the iconic Arts and Crafts home of Henry Turner Bailey. “H.T.B.,” as Berman calls him, famously championed public education in the arts and authored the 1914 book Art Education. “It was like moving into Sleeping Beauty’s castle for Arts and Crafts,” he muses. He spent years restoring the house, hoping to purchase it from Bailey’s heirs. 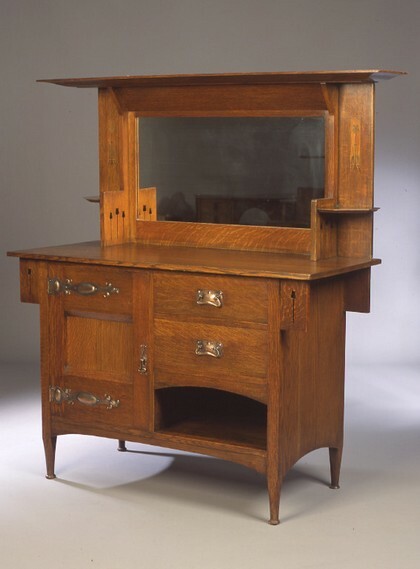 While living at Trustworth he began making furniture in the style of New England antiques. “No one wanted to buy it,” he comments, so he turned his focus to furniture in the English Arts and Crafts style. An English course in high school had introduced him to late-Victorian literature; in an effort to bring the period to life, the teacher had shared a photo of the parlor at Wightwick Manor. Berman was entranced by the vision of wood-panelled walls, stained-glass windows, and Morris wallpapers, which he says “percolated in the back of my head.” The archives at Trustworth offered a treasure trove of research material. Berman immersed himself. Especially fascinated by the work of C.F.A. Voysey, Berman built a clock, numerous light fixtures in wood, glass, and copper, and a variety of furniture in his favorite designer’s style. In 1994 Berman’s dream of buying Trustworth fell through and he moved to Plymouth, where he purchased a 1910 shingle style cottage. “Not really habitable,” he describes its state at the time, what with broken windows, a leaking roof, and no working plumbing or electricity. He threw himself into restoration, then ran the place as a bed and breakfast for a few years. In the meantime he returned to building furniture and lighting, the income from which proved barely enough to scrape by on. It was at this point that Berman realized he could parlay his knowledge of historic architecture and interiors into period design consulting. Which brings us to the subject of wallpaper. The digital technology for printing papers was “just good enough” at the time. He taught himself to use a computer, and as the printing technology improved, his skills grew with it. Basing his patterns on meticulously researched original Arts and Crafts designs, Berman produces a growing line of wallpapers and fabrics for residential and institutional interiors, in addition to commissioned papers for historic houses. You’ll find them at the Peabody Essex Museum, the High Line Hotel, and other institutional and commercial locations, as well as in homes on several continents. I spent last week in England doing research for a Popular Woodworking book on English Arts and Crafts furniture. Monday took me with my good friend Bronwen to the impossibly picturesque Gloucestershire village of Chipping Campden, where C. R. Ashbee moved his Guild of Handicraft in 1902. Although the original Guild was dissolved in 1908 due to financial troubles–the move from London to Chipping Campden made it harder to reach the necessary clientele, an unfortunate (though predictable) problem that was compounded by a widespread economic slowdown–it was reorganized as a trust and operated until 1914. Some of the craftsmen continued their work independently thereafter. One vestige of Ashbee’s Guild still operates today: Hart Silversmiths, located in a small workshop on the second floor of the old silk mill building on Sheep Street. Here’s a brief virtual tour. Derek Elliott has worked at Hart’s for 35 years, since he finished high school. On the day of our visit Derek was working on this silver bowl, which started out as a circle cut from this sheet. The decanter is one of many variations on a signature Ashbee design. A wood stove stands at the middle of the workshop. A no-frills filing system takes care of invoices paid, which must by law be kept for several years (those are pinned to the rafters) and those still due (the white ones clipped in a sheaf). Amidst all the history, you will still find a few plastic-handled tools, modern light bulbs, and even a telly. The guest book includes evidence of a visit by a certain American architect in 1910. No doubt some wit will point out the oddness of the bolts on the outside of the door. Rest assured, there was a variety of locks on the inside as well. Visiting Chipping Campden was like bringing the pages of a Penelope Hobhouse gardening book to life. My dear friend Bronwen (left) drove us to Chipping Campden. We went for tea after visiting Hart’s. No, not that kind. Get your head out of the gutter. This kind. See that worker on the left? I’m talking cross-pollination. 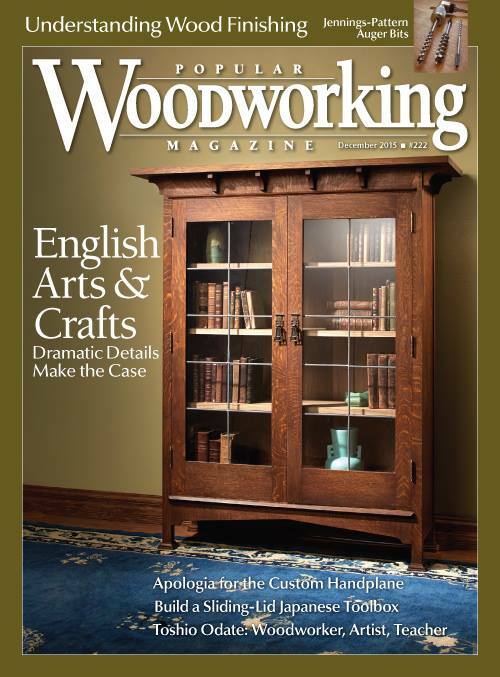 When Megan Fitzpatrick invited me to propose an Arts & Crafts style bookcase as a project feature for Popular Woodworking Magazine, I designed a piece in a turn-of-the-century vocabulary I’ve learned to love, that of Harris Lebus. I figured I’d sub out the glass and asked my favorite leaded glass artist, Anne Ryan Miller, whether she’d consider doing a pair of plain panels. She was too busy. In any case, Megan thought the feature would be improved if I did the glass myself. Just one problem: I knew nothing about working with leaded glass. So I turned to another trusty resource, Fine Woodworking, and found an article by Mike Pekovich on leaded glass basics. It was helpful. A few weeks later, former FWW editor Steve Scott got in touch to request a submission to his “40 Years of Inspiration: How Fine Woodworking influenced generations of woodworkers” for the 40th-anniversary issue. I cited Pekovich on leaded glass as one article that has been especially useful to me. Credit where credit’s due. You can subscribe to Popular Woodworking here. The bookcase feature is in the December 2015 issue. Keep pollinating. Issue number 231 of Fine Homebuilding magazine includes my interview with British kitchen designer Johnny Grey, creator of the Unfitted Kitchen. * Due to space constraints, the published version contains only a fraction of the material I took down during a telephone conversation that was over an hour long. Here’s a version with some fascinating bits that had to be excised from the Tailgate interview. Square brackets indicate words inserted for clarity or relocated from other parts of the interview for narrative flow. My mother was a bit of a romantic. She had this great passion for the Sussex Downs, [where] she bought a sweet little abandoned cottage. She had a strong vision [for its restoration]; it wasn’t going to be added onto or poshed up. She [also] bought a gypsy caravan and kept it parked in a field at the cottage, visiting on weekends. I was conceived in it. [Eventually there were five kids—four boys and a girl] in a house with just two bedrooms. The caravan became our third bedroom. [But it also played another important role in my life.] Being made of painted softwood with a canvas roof, the caravan was always leaking. It became a rite of passage for each of us to fix this wretched roof. [That was how we] learned woodworking. What was your training in design? I studied architecture at the Architectural Association in London [during the ‘70s] It was a place of intellectual ferment, a design hothouse. I was exposed to incredible ideas. Ivan Illich dropped by and gave a talk. Buckminster Fuller gave a talk. Lyall Watson launched his book Supernature [there]. How did you get into kitchens? It was all a big accident. I disliked the corporate world and loathed the business of my hours being “owned” by other people. Because of my rather bohemian background in Sussex, I felt I couldn’t handle a job where I wouldn’t be making anything. The thing about kitchens is, you can do a bit of everything—design, making, meeting the clients. Today, the kitchen has become a real place. It used to be a second-rate room for women and servants. In the ‘70s, people began to realize that there was a real role for a kitchen company: to plan the big picture–layout, flooring, lighting, etc.–in addition to cabinetry. I have a strong emotional bond with furniture. [My great-grandmother became an antique dealer after her husband died. My mother, too, loved antiques.] While studying architecture I ran an antique business. I had to develop my own sense of style very quickly, since in that line of work, your living depends on being known for a particular style. Do you remember any particular kitchen from your early days with special fondness? [My first job], the Gothic kitchen, was tremendous fun. Every piece in the room was from a different period of gothic, but it had a sort of happenstance unity. My client, Sam, invited the features editor of Harpers to dinner. Before you knew it, Harpers had commissioned a story—Sam would write the recipes, and I would write about the design of the kitchen. A Helmut Newton[-like character] photographed the client sitting with his bottom in one half of the sink, his legs hanging over into the other, and a stuffed parrot on the stove. It was really about being rather lunatic and enjoying ourselves. Don’t forget, at the time, all people were buying were those Poggenpohl[i] kitchens. This was a protest against that. Where are your kitchens built? [We work with several workshops.] [Some are] bespoke quality, the best furniture money can buy. Some are [outfits] that have moved from joinery into cabinetmaking; they’ve got their costs under control [and have] some very good craftsmen. [We also work with] very small furniture mak[ing shops], using them in groups. We don’t want [the furniture] to match anyway, so it’s perfect. Where are you now in thinking about kitchen design? When I first started out, nobody thought the kitchen would be anything of consequence. I want[ed] to steer it into its own territory, where [kitchen design would] stand on its own as a profession. Many people think the kitchen is a place where you fling cabinets around the wall, but I respect the kitchen. I think it’s our best chance of creativity in the home, because it plugs into so many different aspects of home life. Bringing neuroscience in has been another piece of the puzzle. [The kitchen] is the most emotionally high range room. [Sharing home-cooked food] around a table in your kitchen is the high point of the day, the essence of family life. You have a chance to look outward and inward at the same time, and connect with your family. The hormones that make you human are more likely to be in operation when you’re around the table than at any other time. You have to feel safe. It’s got to be the right time of day to fit into [your] rhythm. [The kitchen] has to make you feel good. It’s got to have enough room to move around and to invite guests. It really has become this absolute room for sociability. You can’t have democracy without a place where you can enjoy the reason for living. When I published The Art of Kitchen Design, it was the first time anyone had written about the sociable role of the kitchen. Neuroscience validates that social role. I think I arrived at the right moment, really. What happened to the kitchen would have happened anyway, I think, but I’m glad I was there to be part of it. *Warmest thanks to Johnny Grey for consenting to this interview and to Chris Hoelck at Fine Homebuilding for his help in getting the piece to the published page. A reader submitted a comment on American Bungalow Magazine’s blog in response to my story about defunct English furniture manufacturer Harris Lebus. She had seen a sideboard similar to one of those pictured in the article and wondered whether it was worth the price being asked. I am not an appraiser, I responded, and I am always struck by the notion that one can actually say what a piece of antique furniture is worth, considering the basic fact that value is a social construction. Unless you are buying furniture primarily as a financial investment (and let’s be honest–few of us are), antiques are worth whatever you are willing to pay; the art of valuing such objects comes largely through the stories we tell about them (Who made this chair? Where was the maker trained? Was the artist’s grandfather a famous explorer? Perhaps the piece once belonged to a famous family? ), and those stories are subject to change, depending on memory, documentary evidence, etc. The sideboard that inspired my American Bungalow article is a good case in point. When the owner bought it, he was led to believe–by an honest and well intentioned dealer who did not at the time know anything about Harris Lebus–that it might have been made for Liberty. The Liberty connection made the piece seem eminently worth the price he paid, although the same price struck him as excessive once he learned about the piece’s actual provenance. But here’s the thing. As a professional furniture maker, I ask myself whether anything about the piece changed because of its lack of connection to Liberty, and of course I answer “no.” It’s still a knockout in terms of design. It’s still well made (though not all Lebus pieces were so well constructed). It’s still a truly functional piece. And I think to myself (and am suggesting that you, if you have read this far, also think to yourself), Perhaps we should reassess our notions of value with respect to Lebus artifacts. This goes not only for pieces made by Lebus, but by other makers, too. When it comes to putting a price on objects of beauty and utility, have confidence in your taste. Professional appraisers in all fields have their place, but their methods tend to be inherently conservative–that is, based on documentable examples of past sales. Every so often someone comes along–it has to be someone wealthy enough to bust the valuation ceiling–and pays far more for a piece than anyone ever thought reasonable. Suddenly we permit ourselves to view that piece, and potentially others by the same maker, as more worthy of our attention and esteem than anyone would have imagined possible. But isn’t there something a little embarrassing in the notion that we need an expert (or a celebrity) to validate our own sense of value? Isn’t this a bit like the emperor who had no clothes? Obviously if you’re spending someone else’s money, buying primarily for financial investment, or investing on an organization’s behalf, you should engage a professional appraiser. But in ordinary circumstances, the kind most of us face, if you love an object and can afford the price being asked, by all means buy it. Don’t be overly concerned about what it’s worth. Many–and quite possibly most–dealers, like the majority of contemporary artisans, are not attempting to fleece you, but simply to make a living and cover the costs of doing business. If people give you a hard time for supposedly having paid too much for a piece, don’t let them get under your skin. Just tell them that to you, the piece is worth what you paid. By doing so, you will join a movement to rethink the value of artifacts made by those (whether the Harris Lebus Manufacturing Company or your neighbor) who furnish the homes of ordinary people, rather than those of rare wealth.